For entertaining, it's always easiest and the most affordable to settle on one signature mixed drink. Then you can buy the ingredients in bulk and mix it all in one big pitcher, so you don't spend the whole night behind the bar. It also helps to pick a cocktail that calls for few ingredients so you don't have to spend a lot of money on several different kinds of expensive liquor. Enjoy this roundup of refreshing summer cocktails which only call for three ingredients or less. Cheers! 1. 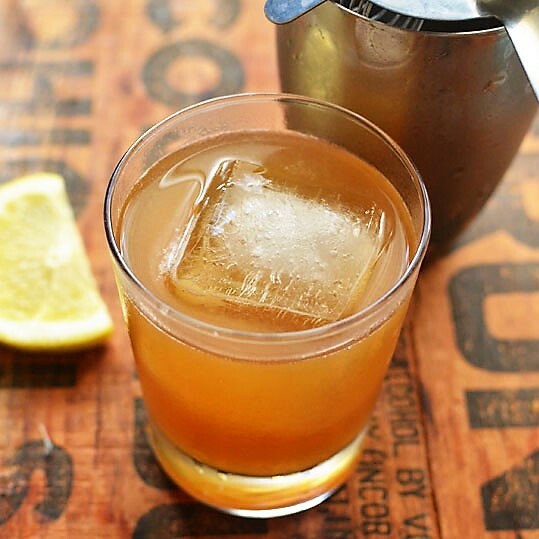 The Gold Rush (pictured above) by Faith Durand from The Kitchn: This easy summer cocktail calls for bourbon and honey. I'm a big fan of bourbon, and I love honey. This sounds like a perfect match, don't you think? You could use this recipe to make your own honey Bourbon, which is used in several drinks on this list. 2. The Cherry Caipirissima from The New York Times / Dining and Wine, Adapted from Meaghan Dorman, Raines Law Room, Manhattan: This cherry-flavored cocktail was all over the net when it first appeared on The New York Times site. Take one look at the photo, and you'll see why. 3. Raspberry White Wine Spritzer from Kitchen Nostalgia: The author behind the food blog Kitchen Nostalgia learned how to make this easy summer drink from her grandmother, who used her homemade raspberry syrup in the recipe. 4. The Flamingo from Saveur: This rum-based cocktail calls for Izzie Grapefruit Soda, my favorite flavored soda. It must be delicious! 5. The Barbados from Serious Eats: Made with lime juice and dark rum, this drink is a strong but fresh summer drink. 6. 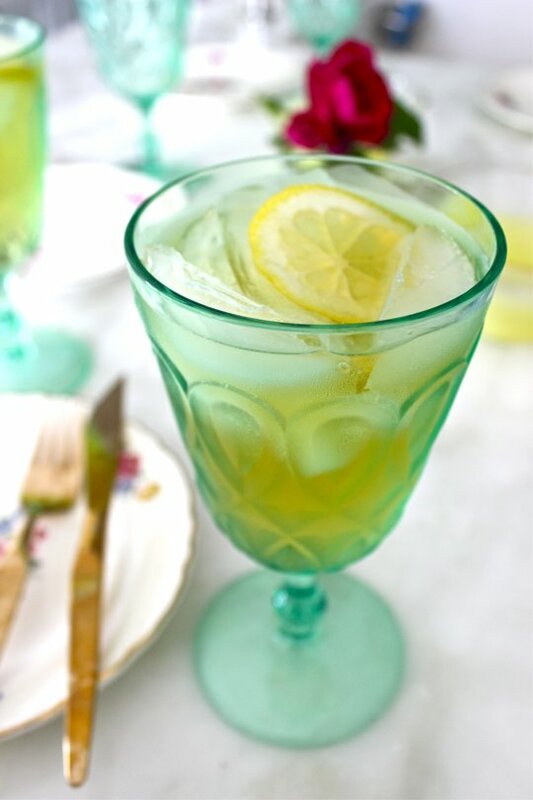 Limoncello Gin Cocktail (pictured above) by Maureen Petrosky from The Kitchn: If you've ever had Limoncello, an Italian liqueur made from lemons and vodka, you know this drink is not for sissies, though this one gets a fair amount of club soda to balance it out. You can make the limoncello from scratch, but to make things easier, you should be able to buy it ready-made. 7. Grapefruit Mimosas from Popsugar Food: What a great spin on the traditional mimosa, mixed with champagne and orange juice. I still remember the first time I had a mimosa. I was on a date, listening to one of my favorite bands, with a gorgeous Greek guy who was quite a bit older than I was. He dumped me two weeks later after he went back out with his ex-girlfriend. It was a fun affair while it lasted. 8. Blackberry Bramble from ivillage: If you're a tequila kind of gal, try this blackberry cocktail, which calls for tequila and blackberry liqueur. Yum! 9. Dark & Stormy By Dale DeGroff from Epicurious: This summer cocktail is way too easy. All you need is ginger beer and dark rum. The dark rum against the lighter beer causes a cool ombre effect. 10. The Paloma from Serious Eats: Similar to The Flamingo cocktail, this calls for grapefruit soda and lime, though the Paloma contains tequila instead or rum. 11. 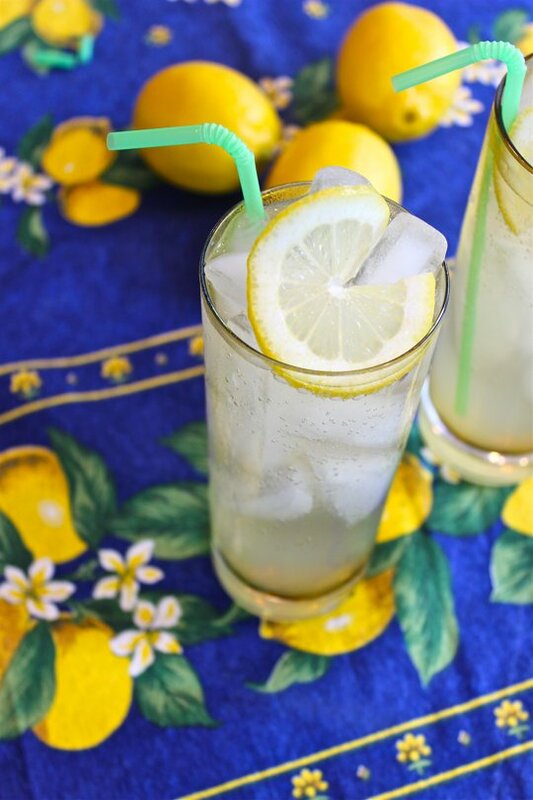 Honey Bourbon Lemonade (pictured above) by Maureen Petrosky via the Kitchn: Just like the Gold Rush, this contains honey Bourbon, with the added treat of lemonade. Now that makes me think of summer in the south. 12. The Salty Dog from about.com: This cocktail is a simple mix of gin and grapefruit juice. Simply switch the gin with vodka and leave the rim unsalted, and you've got yourself a greyhound. I'm much more of a vodka drinker, so I'll take the greyhound. 13. Bellini by Mario Batali from foodnetwork.com: This is my favorite Italian drink, especially for Summer. It's a simple blend of fruit puree and Prosecco (Italian sparkling wine). You can substitute any sparkling wine. I love Martini & Rossi Asti. You can also use different fruits, like raspberries. 14. Malibu Red Margarita from SheKnows: This drink calls for rum and lime juice, sweetened with agave. You can also use a simple syrup made with sugar and water. 15. "Life is Peachy" Honey Bourbon Tea from the Cooking Channel: Nothing tastes more like summer to me than sweet peach tea. Simply add in some honey Bourbon, and you've got a refreshing summer cocktail. This one would be so easy to make ahead of time and serve in large dispensers with ice on the side. I think it would be perfect for a casual summer wedding. 16. 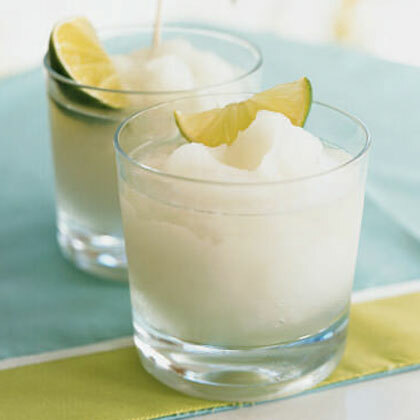 Frozen Lemonade with Coconut Rum, Pictured above: Becky Luigart-Stayner; Styling: Cindy Barr from My Recipes: Frozen cocktails are a must for summer entertaining. Think of this one as the grown-up version of a lemon chiller. 17. Orange Blossom from the Intoxicologist: For this simple summer cocktail, all you need is gin and orange juice. 18. The Sea Breeze from about.com: This is slightly like a traditional cosmopolitan (an old favorite) in that it uses cranberry juice and vodka, but all you need to complete the cocktail is grapefruit juice. 19. The Lotus Flower from Wine Access: This one sounds like heaven to me. I love vodka with apple, I love vodka with cranberry juice, hell, I love vodka by itself. This drink is made with apple vodka, cranberry juice, and ginger ale. Though I think I'd substitute the ginger ale with club soda. 20. Mango Madras from myfoxpheonix.com: This gets mango in its name from the mango rum in the recipe. Simply add clementine juice and cranberry juice, and you're done. I think I'd love it with just the clementine juice and mango rum. What do you like to serve in the summertime? Do you have any quick and easy summer cocktails? I have always loved bellinis, but I haven't ever tried to make one at home. Those sound so good to me too. I haven't made bellinis at home either, but I should this summer. They're so yummy! What no Mai tais? Great list though and I'm wishing you were closer so we could throw back a few of these in style! Oh that would be fun, Eve! I love these. Some are so great for entertaining.